I know someone who has been married 14 years, she kept her own last name. Not really sure of reasoning behind it. My wife retains her own surname. This is far more sensible if one is a professional who needs or is expected to have a certain degree of name recognition. My sister, also a professional got her PhD in her first husbands name, and is now rather stuck with it, even though she has remarried since all her publications are in that name. There is one problem with women keeping their own last names. Everyone assumes I have the same surname as my father in law, which is a tad strange. And a secondary problem is that whenever my wife books something and I am asked what name it is in, I explain that it could be in one of two names.. firstly her maiden name, and if not under that name then under mine. But these are very minor inconveniences.. the big plus is that there is some distance between her professional interactions under one name in the phone book, and her personal interactions under a different last name in the phone book. So for the most part she can keep her two roles separate. The Spanish do things differently.. your full last name is your fathers last name followed by each of your maternal ancestors last names as far back as can be known. A very long list of known names is something to be proud of, and it does ground on in the full history of ones ancestry. Mmmm… I remembered when I was a child and read about the Joliet-Curie couple. Frédéric Joliot-Curie used his wife last name and I totally agree! Back that time I thought it wouldn’t be better if he had used only his wife last name? “Curie” has a lot of meaning. In Brazil, the first last name of the kids is from the wife. E.g. : Joao Megumi Silva, so you have the mother ” Lucila Megumi Espiritu”, and the father? well, in some cases – from japanese-brazilean people, when they travel abroad – they use the wife last name, e.g. : Instead of Aleixander Silva is Aleixander Megumi. 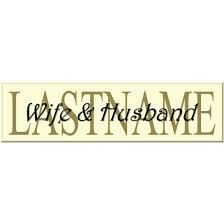 In another latinoamerican countries you have the “de” for husband last names e.g. : Maria Felix Encarnación “de Santos”, this long last names sounds grave and nowadays only elderly people uses them. So, I think it’s increasing the amount of women that retain her last name. I guess it’s not such a big deal, xD, but tradition has influence in it.